Everyone who is reading this would have to agree that 2015 has been a good year for us gamers. Whether it be the summers we spent in the streets of Nilfgaard or exploring the wastelands of Boston locked in our bedrooms, we gamers have had the time of our lives. However, there has been a fair share of controversies seen by the gaming industry too. From Kojima’s debacle to Batman: Arkham Knight’s disastrous PC launch, we have seen it all. One cannot deny the fact that publishers goofed up a lot of stuff throughout the year, and there is still miles to go for them. Here, from the perspective of a gamer, I intend to point out few things that are of utmost importance for the many publishers to mend and regain our lost trust in them, most notable of them being Ubisoft, Bethesda Studios and Square Enix by bringing them in comparison with publishers that earned our respect. Consider this an ultimatum for you, publishers. 1. Learn from the Publisher of the Year. Seriously. CD Projekt Red shattered everything what we considered to be true in the gaming market. Point number 1, The Witcher 3 was announced DRM-free. And then, few days into post-release, the game sold out everywhere. Dear publishers, this is how you make money, not by tricking gamers into pre-orders (more on that later), but by making a really epic and impressive game. Such things are supposed to be taken for granted, not to be pointed out by the gamer. This also serves as a great example of how piracy should be your least concern when you make a really good game. And a key feature of this publisher is the underwhelmed truth-of-the-year that they have made 15 DLCs absolutely free for the gamer. This, is how you respect a gamer. It therefore comes as no surprise to us that CD Projekt Red won the Publisher of the Year unanimously. 2. Optimization. Discuss it in your meetings sometimes. A perfectly well optimized game comes a really long way into the gamer’s heart. Rockstar Studios delayed their PC iteration of Grand Theft Auto V by almost 2 years. But from the moment I started the game and felt the smoothness and rich graphics, everything was forgiven. This is however, a really rare example from my side to be alright with such a delay for their PC port, and I don’t mean to support it in anyways. While people have talked about Rocksteady quite enough, they have completely overshadowed others such as Ubisoft who delayed their latest addition to the Assassin’s Creed series by a month on the PC and it still did not deliver for the extended time that they took with the game. Square Enix delivered a sub par Just Cause 3 when you consider how well the game is optimized. Another example that I would like to include would be Fallout 4. Sure, the game has its own charm and addictive elements, but one cannot overlook the technical difficulties he/she encounters while playing this game. More on that here. 3. An Ancient Long Lost Art Called Good Music in Games. Video game series which have got this aspect right in my opinion would be the Valve originals like the Half-Life and Left 4 Dead series and also the Grand Theft Auto series, with the latter comprising of an excellent radio station that manages to surprise us at every turn. Come to 2015 and ask me which game delivered a really good soundtrack and I will reply, ‘Metal Gear Solid V: The Phantom Pain’. Ask me for any other and I will say none. Assassin’s Creed: Syndicate and The Witcher 3 came pretty close, but what I really want to talk other than good music would be the emphasis given to music by publishers, and not just the quality. MGS V:TPP’s soundtrack sports a length of around 160 minutes with gametime being roughly around 50 hours. In comparison, The Witcher 3 has a highly repetitive soundtrack during combat with a 80-minute long soundtrack to complement a game that would take atleast a hundred hours? Emphasis is the key word, and with it also comes its role in making you ‘feel at home’. Grand Theft Auto is the supreme master in this aspect with Final Fantasy almost hitting the same spot too. And this is where Assassins’s Creed has miles to go before you can make me one of The Rooks. 4. What’s with all these monetary schemes? Let us see this step by step, from the gamer’s point of view. With great graphics and gameplays came a big price, and that is the big price. But wait, there is a catch. Firstly, it seems that you would soon be required to pay to be able to play betas. Then, Ubisoft expects you to pay the price of a full game to be able to play a solely multiplayer game. Later, you have to pay for the horribly expensive Collector’s Edition to get to be able to play a certain character in the game, which you can’t unless you don’t. You then pre-order the game be able to play an exclusive DLC which you can’t play unless you don’t. You then play the game, and entering it realise that the game has a lot of potential for complete enjoyment IF (and I wish I could highlight this further) you pay for the DLCs, all of them, which you can’t play unless you don’t. 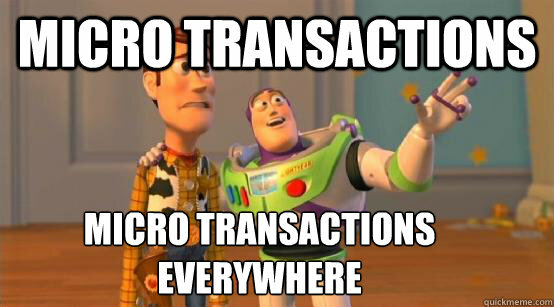 And as you finally get a little ahead into the game and really start enjoying, you realise that what you need to really get ahead is microtransactions. Money isn’t everything. You can earn millions simply by making a really good game, and here I would again like to pull out of leaf from CD Projekt Red. It is in fact really sad how I am forced to be referring to only one publishers. But they have set the golden standard for the gaming industry. Respect the gamer, and the gamer will respect you. And this is something that I can’t emphasise further. 5. Sequels. Pre-ordering scam or a genuine effort for something amazing? Starcraft 2 spent 4 years in development, and was released almost 12 years after its predecessor. Max Payne 3 spent almost 3 years in development. Grand Theft Auto V took 4 years in development. All the above examples have seen massive financial and critical successes. In comparison, we have seen an Assassin’s Creed game every year since its first part with financial success. And other than the critical success that was AC4: Black Flag, since then absolutely none of the games were likened by the audience, with a largely diminishing Assassin’s Creed fan base. While Syndicate seemed to offer something new, few hours into the game and you realise the complete dud that the game has to offer, critically speaking. Let us just hope that Ubisoft doesn’t screw up the legendary open world series in Far Cry Primal and sets things right for the Tom Clancy’s The Division, although first signs don’t look too good. Sequels can be done right. This has been taught to us for 2 decades now by the time tested companies that are Valve and Blizzard. With both of them having a rather surprising number of 7 video game series of their own, each and every single of them dominated the market and had taken it by storm. Whether it be internet sensation Counter-Strike and DOTA 2 or the video games that put the ‘e’ in eSports such as WarCraft and StarCraft, they have made each and every sequel to perfection, leaving no quarter. In conclusion, I’d just like to say this: Dear publishers, it is high time that you learn to respect the gamer and learn from your fellow publishers. Taking the gaming community for a ride with the same crap repacked or giving them bad ports while making all your money in the hype that followed for it which led the customer to pre-order it is NOT cool. There will be some who will argue to not fall in it. The main question lies, should such trickery even exist, let alone asking the customer to not fall in it when we aren’t asking the producer to not make such holes?